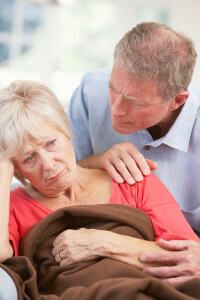 The role of caregiving is no easy road. 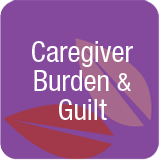 Caregivers feel joy and fulfillment as well as guilt, anger, depression and loneliness. Caregivers feel family members have left them with the goods — the responsibility of physically and financially caring for a loved one. On one hand, caregivers resent time spent caregiving and on the other hand feel guilty because they are not doing more. Life has lost balance and no one seems to understand. Join a caregiver support group to learn ways to cope with the emotional effects of caregiving. This can be an in person or an online group. Sometimes online groups are easier due to the time constraints of caregiving. Begin a personal journal to record thoughts. This may help examine feelings and triggers. Watch favorite movies or listen to music that brings back fond memories. Treat yourself to time away at the movies or even a weekend get-a-way. Hire a paid caregiver if need be to allow you time away. Worry and fear over what might happen can overwhelm all of us, regardless of the circumstances in our lives. Practice replacing worry and fear with hope. How many of us go through life thinking about things we don’t want to happen and then experience them? Our minds do attract what we think. How many times have we changed a day from bad to good by simply focusing and being thankful for the good? How many times we remembered not to lock your keys in the car or noticed a nail in your tire before it went flat? So many times we focus on the irritations in life rather than the blessings. There’s nothing more important than embracing the art of optimism. The art of keeping our mind focused on the positive things, conditions and circumstances we want in our life — and eliminating the negative things, conditions and circumstances. This doesn’t mean having unrealistic expectations of winning the lottery. It does mean focusing on maintaining positive thoughts that will result in positive events. If you are a caregiver, be gentle with yourself. Take time for yourself and acknowledge that you can be in a difficult and frustrating position and still survive with a good attitude. Only you can change your mindset. Sometimes all it takes is a change of scenery. Make a cup of coffee and sit outside or take a bubble bath. A quick ten minute break may be all that’s needed to turn a difficult caregiving day from positive to negative. Copyright 2012, 2013 Pamela D. Wilson All Rights Reserved.